The Scriptural basis for our work can be found in Matthew 25:40—“For as long as you did it to one of the least of these, my family, you did it to Me,” But more importantly, we’re rooted in Jesus’s words in John’s Gospel, commanding us to “Love one another, as I have loved you.” We believe that all are our neighbors, and our relationship with our neighbors must be one of mutual respect and support—including the giving and acceptance of assistance when needed! We are not a large congregation, but we have a HUGE heart. So through the goodness of our members, and their generosity with time, talent, and treasure, we have been able to have a HUGE impact. Below is a quick list of our ministries during 2017-2018—it literally spans the globe, but focuses mostly on needs in our own backyard! If you want to be part of the St. Alban’s Outreach Team (which usually meets on the 4th Thursday of every month at 7:00 PM; check the Church Calendar for details), please contact Elaine. We’d love to have you! Becoming Beloved Community is one of The Episcopal Church’s (and our own Bishop Sam’s) top priorities. It is a series of steps that the Church hopes will move us toward being a community of reconcilers, healers, and justice-makers, not only in the area of racial reconciliation, but wherever relationships are broken, divisions are present, or justice is just a dream. Want to learn more? Check out these links to view/download either the whole plan or a summary of the plan! St. Alban’s cooks, serves, and cleans up at the Soup Kitchen the 3rd Friday of every month, from 8:00 to 12:30. We provide emergency support and shelter for victims of domestic violence and their children. Volunteer opportunities include helping deliver buddy packs, and planning fundraising events for this partnership with Safe Alliance. We help keep the clothing closet stocked with replacement uniforms for children who have emergency needs during the day, or families that can’t afford uniforms. We also assist with their community garden. DCCDC is the only 5-star, full-day sliding-scale day care in Mecklenburg County, offering safe care for children of low-income working parents. Volunteer opportunities include building maintenance, being a "reading buddy," or assisting in other ways. A child and family support program with a residential component that addresses the needs of some of the most abused and neglected children in the state. Volunteer opportunities include helping to arrange and promote the Thompson’s offering, and participating in the shoe distribution. The annual Thanksgiving Turkey Drive helps provide turkeys, hams and other holiday meal ingredients to families in need in Davidson and Cornelius. This annual drive helps feed about 40 families. Volunteer opportunities include bringing food gift cards for turkeys or hams, donating other food items, and helping sort and package donations. 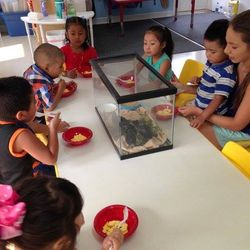 A bi-lingual pre-school, LESA uses a specialized curriculum to teach English and prepare these children, ages 3 and 4, for public Kindergarten. Our two classrooms are located in the Ada Jenkins Center. Volunteer Opportunities during the school year and during the summer program. It serves the refugee, immigrant, and low-income community in the very diverse section of East Charlotte, and is located at 3601 Central Avenue. Ministries include English as a Second Language, Loaves and Fishes Food Pantry, Refugee Support Services, Catholic Charities Summer and After-School Programs, a Ministry of Hospitality, a Community Garden, and many other opportunities to assist. St. Alban’s partners with other churches in the community for a major back-to-school support project for families that need help. We collect money, backpacks, provide shoes through Samaritan’s Feet, and school supplies, and distribute them through a major event each August held at Gethsemane Baptist Church. St. Alban’s regularly supports Our Town’s Habitat with funding and volunteer labor. Recent projects include the Interfaith Build, as well as work on urgent repairs for several homes. All who can swing hammers, come on out! A St. Alban’s parishioner has worked with the Esther Sewing Project to help women in South Africa earn an income making high-quality household goods. St. Alban’s folk played a key role in the development of the Hogar Escuela Heredia, which provides day care, pre-school, after-school care for children who would otherwise be on the street, and job training for their parents, who live in the slum of Guarari. Volunteer opportunities include mission trip participation (fun, fellowship and service), sponsorship of children at the Hogar Escuela, and helping with item sales to raise funds for the programs. St. Alban’s hosts a Rise Against Hunger packing event every year in the summer. Although this is primarily an international outreach, it is such a wonderful community-building event. Volunteer opportunities include promotion, set-up and clean-up, and of course the fun of packing the meals with your neighbors!